The two first weeks of the MIAA Football regular season are now in the books, and SuiteSports is ready to release its second regular season MIAA Football Top 25 Poll as selected by its panel of writers, correspondents and editors. There is a shakeup in our top five, with North Andover grabbing the No. 5 spot following a win over Lowell on Saturday afternoon. Elsewhere, Needham (No. 14) and Brockton (No. 15) have firmly supplant themselves in our top 15 while Braintree (No. 17) makes its season debut. We will have more high school football coverage throughout the week, including our first high school football notebook out tomorrow, but for now here is our updated MIAA Football Top 25 Poll. 1. Everett (2-0; Last Week: 1) Forget catching Everett, it's going to be interesting to see whether anyone can simply slowdown Mike Sainristil. 2. Lincoln-Sudbury (2-0; Last Week: 2) Following another statement win over Melrose, there is no question the Warriors are the team to beat in Div. 2. 3. 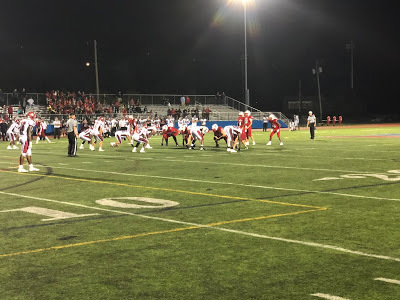 Catholic Memorial (2-0; Last Week: 4) Knights were in a dogfight for most of Friday night versus Stoughton, before pulling away for a 20-7 win. Lucas Folan is quickly becoming one of the top lineman to watch. 4. Xaverian (1-1; Last Week: 5) Hawks rebounded from an opening week loss to Everett with a quality victory over Bridgewater-Raynham. Xaverian will now prepare to host New York power Archbishop Stepinac. 5. North Andover (2-0; Last Week: 6) We may only be heading into week three, but Jake McElroy has already proven he is one of the top quarterbacks in Massachusetts. 6. St. John's Prep (2-0; Last Week: 7) Following a 29-12 win over Central Catholic, the Eagles have supplanted themselves as the biggest threat to Everett in Div. 1 North. They will get a chance to knock off the Crimson Tide on Saturday. 7. Mansfield (1-1; Last Week: 3) Hornets are not the first team to succumb to the Everett machine. No question their contests versus BC High and the aforementioned Crimson Tide will prove useful when league play starts this week. 8. Mashpee (2-0; Last Week: 8) After Mashpee's win over South Hadley the longest active winning streak in Massachusetts football is up to 22 games. 9. Doherty (2-0; Last Week: 10) Tajon Vassar scored three touchdowns in the first quarter as Doherty cruised past Holy Name on Friday. 10. Duxbury (2-0; Last Week: 11) After an early scare from Scituate, Duxbury pulled away in the second half for a 35-23 win. Tim Londolfi showed the Dragons are far more than simply the John Roberts and Will Prouty show. 11. Shrewsbury (2-0; Last Week: 13) Drew Campanale proved he has a flair for the dramatic, leading the Colonials 81 yards down the field over the final 1:45 before capping it off with a two-yard keeper to lead Shrewsbury past Grafton, 19-16. 12. North Attleboro (1-1; Last Week: 9) One week after halting King Philip's 25 game winning streak, the Red Rocketeers were stunned by Bishop Feehan in the biggest upset of the week. 13. King Philip (1-1; Last Week: 12) Ryan Halliday will be one of the up and upcoming running backs to watch as this season unfolds. 14. Needham (2-0; Last Week: 15) It seemed that every time Hopkinton forced Needham into a fourth down, Matt Smith had them right where he wanted them. 15. Brockton (2-0; Last Week: 17) Isaiah Laguerre may have made the play of the week, coming through with a blocked punt in the closing seconds of Friday's showdown with Natick to lead Brockton to a 2-0 start. 16. Springfield Central (1-1; Last Week: 18) Quality bounce back win for the Golden Eagles as they made a big Div. 3 statement with a 61-34 win against defending Super Bowl champion St. John's Shrewsbury. 17. Braintree (2-0; Last Week: NR) Wamps jump into the poll at No. 17 courtesy of a big win over previous No. 20 Barnstable, 47-27, on Saturday morning. Somewhere, Billy Silvia just scored again. 18. Central Catholic (1-1; Last Week: 16) St. John's Prep all around attack proved a little too much to handle as the Raiders saw the Eagles pull away late. 19. Hingham (1-0; Last Week: 19) Harbormen had a bye week, giving them two weeks to prepare for a matchup with Whitman-Hanson set for this Friday. 20. Tewksbury (2-0; Last Week: 22) Redmen overcame a fourth quarter deficit against Methuen courtesy of the leg of Tyler Keough. A tough road test against BC High on Friday will tell a great deal about where they stand. 21. Whitman-Hanson (2-0; Last Week: 24) Despite being without starting senior quarterback Ethan Phelps due to illness, the Panthers still managed to hold off New Bedford to remain perfect on the young season. 22. Lynn Classical (2-0; Last Week: 24) The stat sheet never seems to be too small for Keith Ridley. 23. Stoneham (2-0; Last Week: NR) One season after falling just short in the Div. 6 state semi-finals, it looks as though Stoneham has all the pieces to make another run. 24. BC High (1-1; Last Week: NR) Eagles back in the poll after John Brillo picked up his first career win as head coach in a 24-0 win over Marshfield. The current combined record of BC High's final five opponents: 9-1. 25. Barnstable (1-1; Last Week: 20) Red Raiders fell victim to the Billy Silvia train in week two, but certainly have the tools to be a sleeper in Div. 2 south.